8:15am - Ms. John and Ms. Hewitt, our TK teachers, pick up their students from the cafeteria where they have been waiting since being dropped off by their parents. 8:20am - In the TK classroom, the day begins on the mat! "Did you all have wonderful dreams last night?" Ms. John asks the seated students. She calls on a few students to share their dreams, and reminds them to use full sentences when speaking to clarify their stories. Everyone stands up to sing a welcome song and say the Pledge of Allegiance. A song about the fifty states of the United States follows, and finally, the students sing the Mickey Mouse Club song, which they have been learning in Music class. "What day is today?" Ms. John asks when the students are all seated again. As a class, the students say, "Tuesday!" and count up on the class calendar page for October to find out what day of the month it is. Together, they say the full date: Tuesday, October 24, 2017. Ms. John follows up by orally quizzing the students on the months of the year. "Which is the first month of the year?" she asks. "What is the last month of the year?" It's time for some counting! 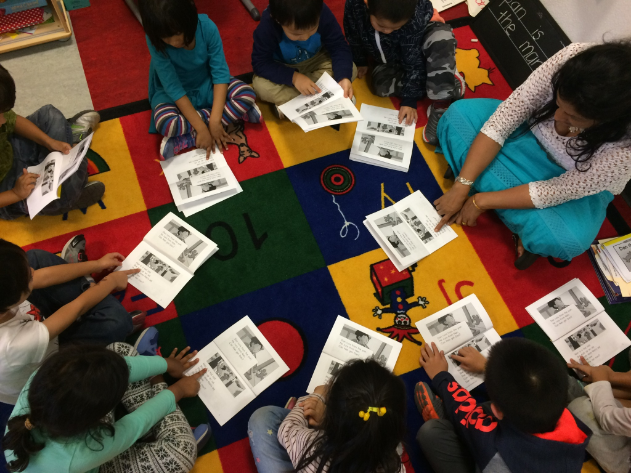 Using a chart of the numbers from one to one hundred, the students count from seventeen to fifty seven together. Then, they practice counting backwards from twenty to one. 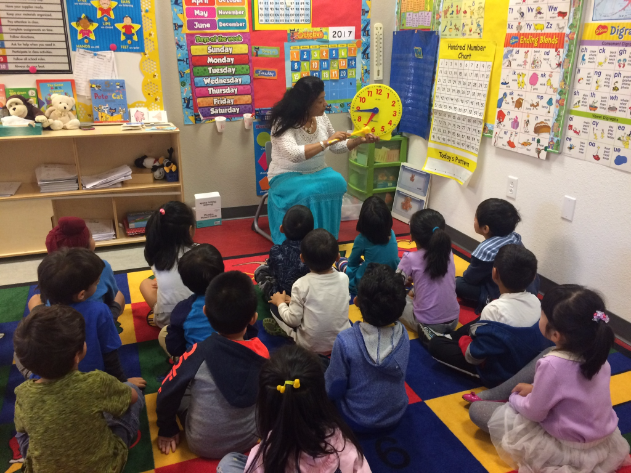 Ms. John has a new thing to show the students today: a clock! "It's very important that you all learn to count by fives," she says as she points around the edge of the clock at the minutes. The math lesson continues with counting and simple addition. "When you add one to a number, you count one number higher!" 8:55am - Students move from the rug to the tables, where they work on math problems using colored squares. 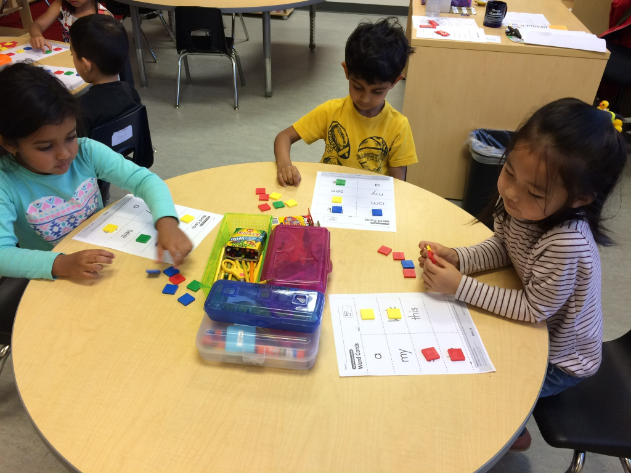 "I'm going to put up a number on the board and you show me that number with the blocks," Ms. John says. She also writes numbers on the board in sequence, removing one, and asks what the missing number is. "2, _, 4. What is the missing number?" 9:20am - Time for recess, and to talk to some of the students! 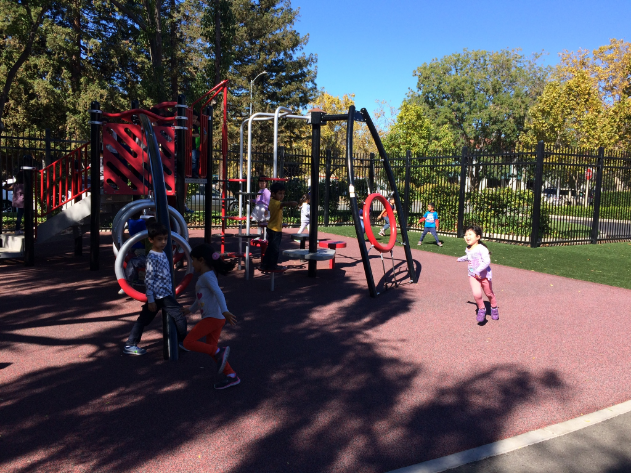 "I love the recess time and the time that we learn!" says Jia. "I love saying the Pledge of Allegiance because we're showing respect for our flag!" "I like the outside play," says Trevor. "I like to be inside," says Jay. 9:40am - Time to line up to go back inside! It's snack time now in the classroom. 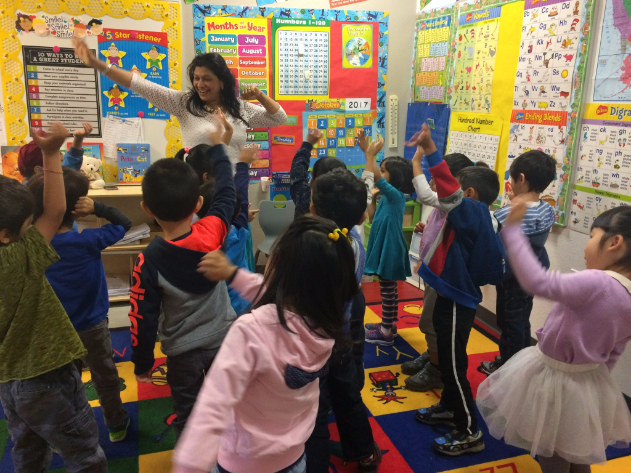 Students eat their food, then get up and groove to a song about counting by fives. 10:00am - Students work on a counting worksheet. Ms. John comes around asking the students if they have questions and helping to illustrate problems as needed. "If I have six pencils in this hand," she says, holding up pencils, "plus zero pencils in this hand, how many pencils do I have?" The whole class reviews the answers to the worksheet before moving on to a pattern worksheet. There are repeating patterns on the sheet, and students have to continue the pattern in blank spaces. Ms. Hewitt takes aside a student who needs more number review. They sit on the rug next to the number chart and go through the numbers one by one. 10:20am - Back to the rug for phonics! The class sings a "Short Vowels" song, then Ms. John pulls out some letter flash cards. 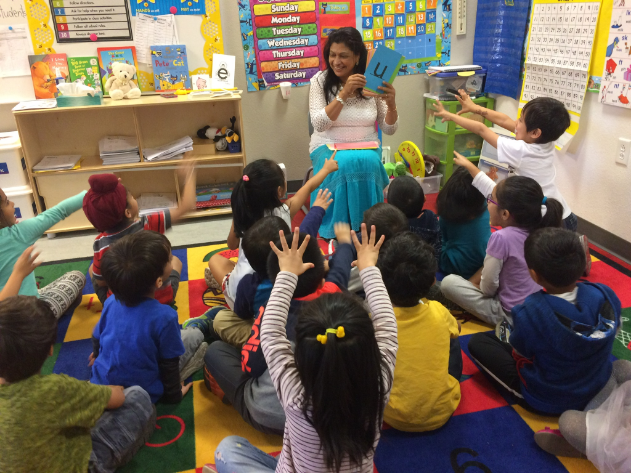 She flips through them letter by letter, and the students shout "STOP!" when she reaches a vowel. Meanwhile, Ms. Hewitt checks everyone's homework and worksheets. Ms. John puts on enormous glasses and asks the students for "sight words," words they should know by sight and not have to sound out the phonics for. 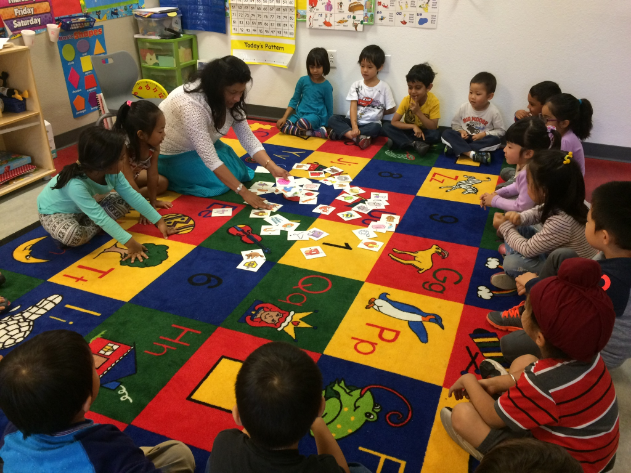 They practice beginning and ending sounds using flash cards next. "Pick a card. Tell me the beginning sound, the ending sound, and the middle sound," Ms. John says. "Pick something that starts with "puh" or "buh," she says, and a student picks up a picture of a pig and a picture of a bug. 11:00am - Stand up and shake your sillies out! The class gets up to move around before heading back to the tables to play bingo with word cards. 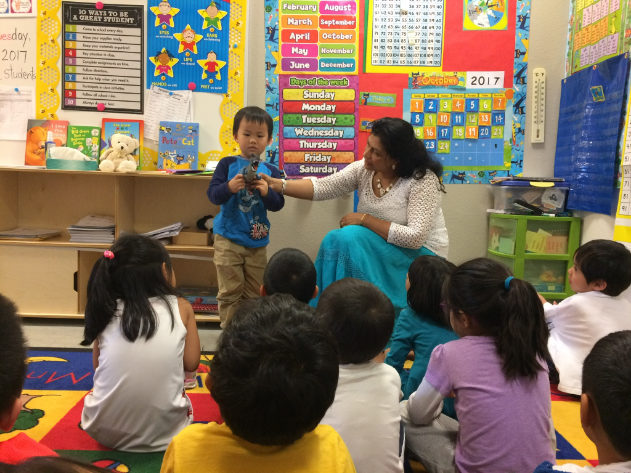 "We are learning about listening skills," Ms. John says to a student who is getting distracted. "If you're worried about what the person next to you is doing, you're going to miss out." 11:15am - Brain break! A move-and-freeze video is put on, and the students dance around following the video's instructions. 11:25am - Lunch is in the classroom, then the students head to Movement class with Ms. Burley. She shares poems about walking and running with the class, and they play Simon Says and a walking game. 12:45pm - Recess time again! There are several ten minute long recesses throughout the day for the youngest students so they can run around and be outside. Healthy kids are happy kids, after all. Right now, Dean of Students Ms. Julie is working on the outdoor garden, and many of the students gather to watch. 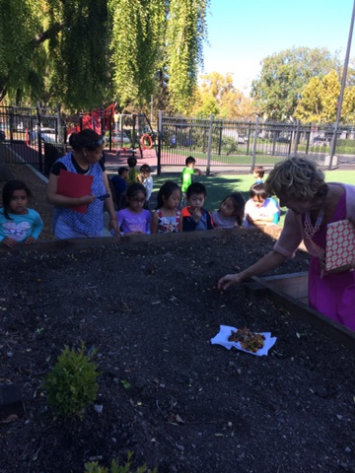 "We're growing carrots!" Jia says, checking the plant tags Ms. Julie put in the earth. 1:00pm - Time for Music class with Mr. Bosley! Everyone sings along to "Peter, Peter, Pumpkin Eater" and practices clapping along to "We Are Scary Skeletons." They sing "Five Little Pumpkins" in piano and forte. They move on to "Hey Betty Martin," where the students have to listen to the instructions in the song and watch Mr. Bosley for visual cues of what action they are going to perform next. 1:35pm - Mandarin class is up next, and the students split into two classes (heritage and non-heritage speakers). 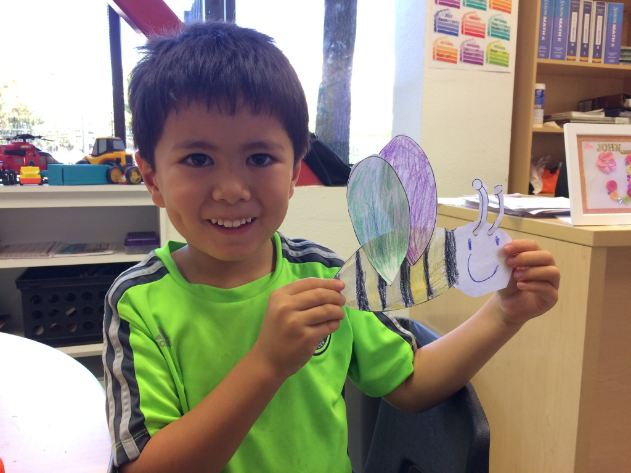 In the non-heritage class, the students cut out and color bumblebees and learn words to describe what they are working on. 2:15pm - Ms. Hewitt begins a lesson about doctors to introduce a project where the students will be making their own doctor supply bags out of paper. "Who do you see at a doctor's office?" Ms. Hewitt asks. "A doctor!" "A nurse!" the students reply. "What about the person you see when you walk in? What do they ask for? Your name?" "Your password!" one student shouts. Ms. Hewitt talks to the students about symptoms, and prescriptions. She adds new vocabulary words, too. "What do we call it when everyone gets chicken pox because of us?" she says. "Repeat after me: contagious." "Contagious," the whole class says in unison. "I want to be a doctor when I grow up," says Dylan. 2:35pm - Recess and snack time! Coach Andy is outside this time, and he throws a football to students who want to play that game. 2:55pm - Everyone comes back inside from recess and continues to work on their doctor bag project. 3:05pm - Reading is up next, and students divide into groups based on their reading comprehension level. Ms. Hewitt works with one group at the tables, and Ms. John sits on the rug with another group and goes over reading skills with them. 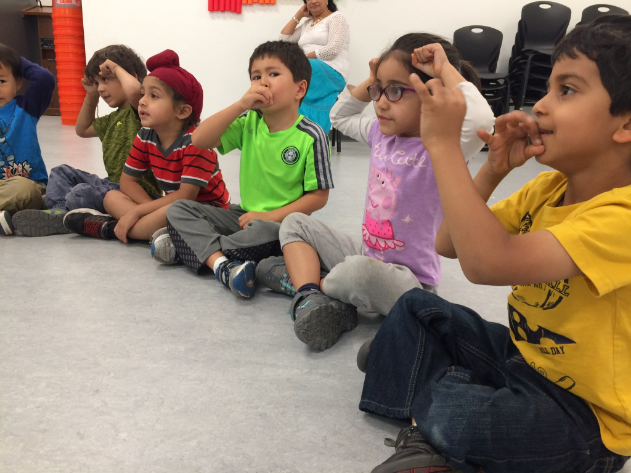 "When you are reading, you start from left to right, and I want you to follow the words with your finger," says Ms. John. Students take turns reading out loud, and both teachers ask their groups questions about the story. "What happened in the middle of the story? What happened at the end of the story?" 3:25pm - Time to share! Students who brought in items from home to share stand up in front of the class and talk about what they have brought in and answer questions from their classmates. Jia brought in an owl she made out of plastic beads. "How do you play with it?" one student asks. "It's not for playing," she replies. Rivaan brought in a dinosaur that turns into a steam roller. "Why does it have rollers on it?" Aadvit asks. "It rolls over things and break things," Rivann responds. Aiden has brought in a dinosaur, but doesn't know what to say. "Aiden, you have to talk! That's the whole point of this thing," Ms. John says. "It's a T-Rex," Aiden says, holding up his toy. "Where did you get it from?" Shuchi asks. "Toys R Us," he responds. "How do you play with it?" Anna asks. "Change his feet," Aiden says. He presses a button on the T-Rex and it begins to roar! 3:55pm - It's time to pack up for the day. Everyone sings a goodbye song and gets dismissed. Students this young are capable of learning and retaining so much information, and they do need to be constantly engaged in the material to retain focus. Their days are packed with fun activities and plenty of small breaks to keep the momentum going and keep the energy high. 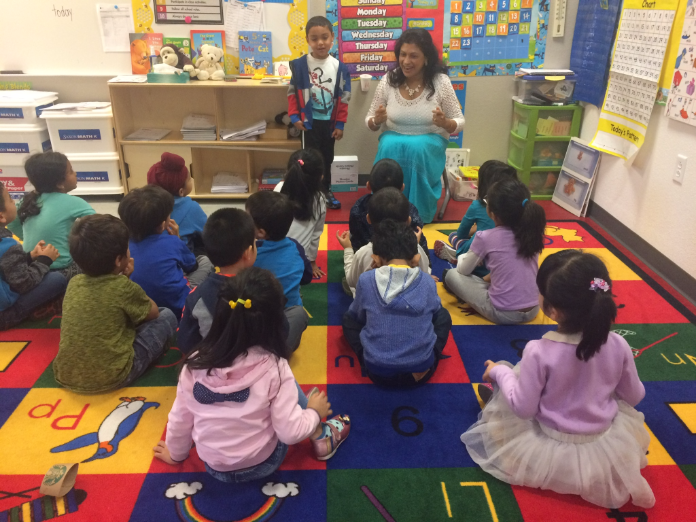 Our TK teachers are more than up to the challenge of keeping the students busy, and they trust their students to keep up with the rigorous lesson plans and are sure to work individually with students who may need extra attention. 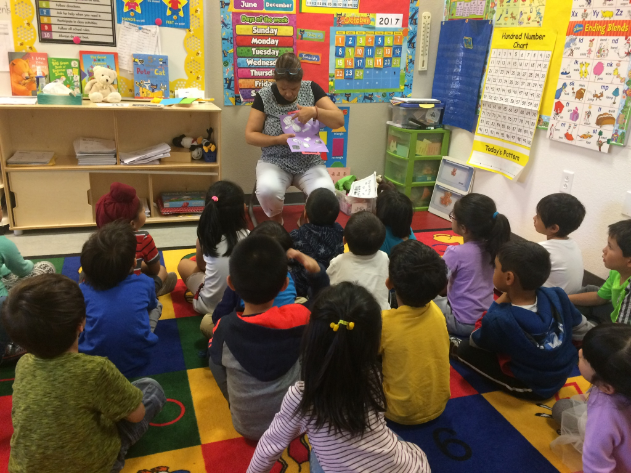 "Our TK program is a wonderful, unique opportunity for young students who aren't ready for kindergarten to experience an advanced curriculum and expand their knowledge," says Dr. Ashley Leyba, Head of School. "They have so much fun every day, and it is a real joy to see how fast they progress when given the opportunity."